This year, TCB-North America will be focusing on driving customer demand in the Atlanta and Newark gateway markets to support additional airlift from Delta Airlines and United Airlines. Plans are underway to maximize today’s ability and technology to use demographic and behavioral data to specifically target the desired customers and leverage the current trend toward mobile marketing and digital advertising, as growth in social media has eclipsed all other forms of reaching and influencing travel based decisions. To keep Bonaire in the forefront of the marketplace as being a destination that offers an award winning scuba diving product and eco-adventure product and more, the key elements of our activities include digital advertising with partners such as Adara, TripAdvisor, Facebook and Instagram; seasonal campaigns to support airlift and working with journalists from both top traditional and non-traditional outlets to increase brand awareness and ultimately increase arrivals from North America. We will also be launching Bonaire’s first “Bonaire Villa Collection” program this spring. Below are samples of some of the creatives that will be used throughout our campaigns. Adara: Retargeting digital campaign that will identify the right audiences at the moment consumers start to research/plan a vacation online. Adara engages with potential visitors to Bonaire during the early planning/dreaming phase of the travel cycle. TripAdvisor: Tourism Bonaire’s Sponsorship page provides a co-op advertising opportunity for Bonaire’s stakeholders with TripAdvisor. 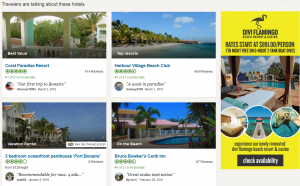 Facebook Advertising Campaign: The ad campaign was created to promote Delta’s Tuesday, Saturday and Sunday non-stop flights to Bonaire on Facebook. The 3 week campaign resulted in 619 website clicks to TourismBonaire.com, and reached 28,303 people that live in the 45 mile driving radius from Hartsfield-Jackson Atlanta International Airport (ATL), as well as ATL’s feeder markets (Chicago, Detroit, New York, etc. ).